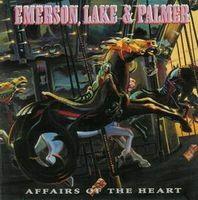 Affairs of the Heart was another single released from ELP's ill-fated Black Moon reunion album of 1992. Unlike the title track (the other single released), this song is clearly in Greg Lake's park. It's basically a nicely done ballad, but hardly memorable, sounding very similar to other AOR bands in the early 1990s (Asia or Saga, for example). The B-side Better Days is only slightly better. Not progressive in any sense of the word. Just an old dinosaur band trying to cash in on their name thinking something like this will get them radio play. Well, it didn't and just adds to ever increasing embarrassment that ELP's 1990s discography has become. Some fans might cringe at this, some might not. Clearly for completionists or collectors of singles from former prog rock bands taking a stab at being "popular." One star is about all I can give this.